You know what time it is, right? 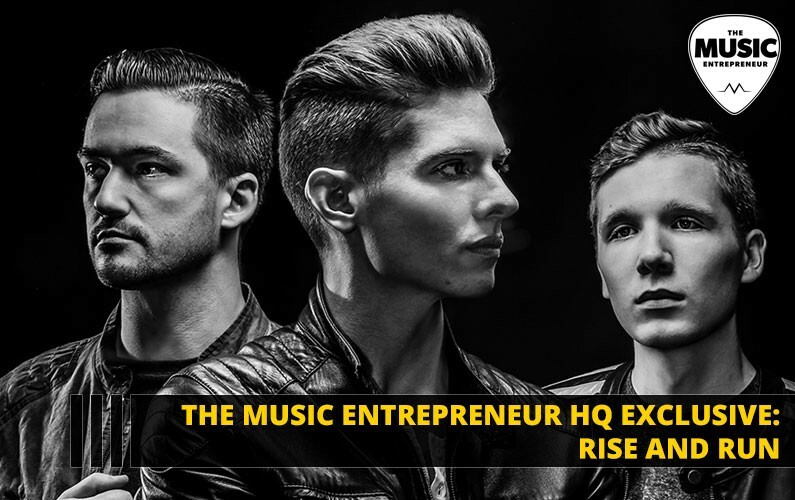 It’s time for another The Music Entrepreneur HQ exclusive. And, this time we have something a little different. We had the chance to catch up with the young and talented band, Rise and Run. They shared with us what they’re looking to accomplish as a band, what some of their biggest challenges have been, how they’ve successfully marketed their music to their audience, and more. So, here’s Rise and Run to fill us in. Austin: We like to think of ourselves as honest musicians who share real life experiences through our songs. Greg: Just a few kids, with a knack for making music. Writing music that we hope will have a deep impact on listeners. Micah: A group of musicians that share a common goal to write music that will impact others. 2. How would you describe the music of Rise and Run? What makes you stand out? Austin: Our music has been described as “fresh” and “forward thinking.” We draw elements from pop and alternative music, but try to venture slowly into untapped stylistic territories. Greg: It depends what song you are listening to. The guys are right; we are not afraid to explore new musical territory. That being said, we have found a comfortable niche among modern pop lovers. As far as what makes us stand out, I believe it is the combination of progressive pop and contemplative lyrics. I like to ask questions in our songs, which becomes an invitation for the listener to walk the complex veins of life with us. We value authentic songs that influence people, who will then influence the world. Micah: I think it draws from a few different styles, but mostly has elements of some modern pop music. What makes our music stand out is that we aren’t afraid of experimenting with different genres or styles and yet shaping them in a way to where they still sound “like us”. 3. You have a couple of singles on the way. What can we expect from these? Austin: When you listen to “Fantasy and Fiction” for the first time, expect to have some fun listening and relating to the story of a guy who sees his self as “unworthy” of a girl’s affection. I think we can all agree that at some point we’ve struggled with the idea of “This person is too good for me” and we have kind of resented it a bit. This is an anthem for those situations. Greg: Well, the two singles cover some wide emotional ground. “Fantasy & Fiction” was built with an upbeat paired against snarky-sarcastic lyrics. gives voice to how a heart can ache over losing someone you have loved dearly. Listeners can expect to feel soulful vibes inside this track. Micah: You can definitely expect a fresh new sound. Anyone who has followed Rise and Run should enjoy hearing how our music has evolved. The song “Fantasy and Fiction” in itself is packed full of exciting dynamic changes that leaves you wanting to listen to it over and over again. “Constantly” is such a relatable song about dealing with loss, anyone can listen to the song and feel the emotion and impact from the music and the meaningful lyrics. 4. What are your plans moving forward? What are you looking to accomplish as a band? Austin: Ultimately our goal is to share our experiences with other people in hopes that they can relate to our story. We’ll keep writing and pursuing outlets to share, whether it’s recording or gigging. Greg: The long and short-term plan is very much the same. Continue growing our catalog of music and making sure people can hear it. By that measure, our work is already outlined. Write, record, tour, and repeat. We have accomplished a lot that I am proud of, and any success in the future is an added bonus. Micah: We want to continue to grow our brand, but to also be creating and writing new music to eventually record new music and projects. Working to create new content is a never-ending goal for us. 5. What is your biggest challenge as a band? Do you have any ideas on how it could be solved? Austin: The biggest challenge I’ve seen is being able to discern the people who are interested in helping us and helping themselves. It can be competitive and cutthroat and we’ve learned that some favors are better left untaken. I don’t know that there’s any way to solve this problem without becoming jaded, so we’ll continue to push forward and make connections we think are genuine. Greg: Being in a band is very much like performing a juggling act. It becomes a matter of balance — balance between pursuing music as an art form, and music as a career. Each band member must absorb managerial roles other than being exclusively a “musician.” The music market is robust and competitive, and artists do not have the luxury of “sitting back” and taking it easy. At the risk of sounding cliché, the modern musician must also become a modern marketer of the music they feel so passionately about. The best solution to this problem is to assemble a trustworthy team around the band. This is something we have already begun and are reaping great results. Micah: Music is such a competitive market, trying to stay ahead of the game is a big challenge. Music is released daily across many different platforms, and the way to be noticed is to give people a reason to listen to your music. We have to be very direct with what we choose to share and to continue to write new music that will catch people’s ear. 6. How important are music sales for you? What’s one tactic you’ve tried that’s helped you sell more music than anything else? Austin: Unfortunately, sales are the reality of business. If we could write and record for free, money wouldn’t be an issue, but in order to keep releasing content, music sales have to be a major part of our vision. Greg: Music sales and, specifically, streaming is SO important. Financially, a band cannot depend on music sales alone, but streaming has become the “magic key” to reaching a wider audience. In that respect, landing music on Spotify playlists has enabled us to reach far beyond our regional borders. This does result in higher music sales, but the greater benefit is growing a relationship with fans all across the world who will one day see us at a concert. Micah: Music sales are super important, not only do music sales and streams turn into revenue for the band, but are also an avenue to grow a solid fan base. The more people listening and purchasing your music, gains social proof for the band, which is vital to growing a brand. 7. Thank you for your time. Is there anything else I should have asked? Greg: This has been an honor for us. Anytime we get to share the “WHY” behind our music, is a good day. It’s all about going through this life as a team. Everyone has a story, different background, unique way of thinking, but we all breathe the same air. As a band, we know we were created to love one another and walk the oddly shaped spaces of life together. Strength and unity are built when we encounter those highs and lows as a team pursuing our higher calling. Consider that an open invite to anyone who wants to link arms with the RR team. Thank you once again David. And, if you have any questions or comments, don’t hesitate to leave them below. Originally published at www.musicentrepreneurhq.com on December 10, 2018.